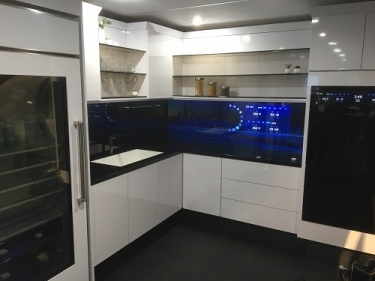 OEM GHSP displayed a connected kitchen prototype in its booth that included an edge-to-edge smart digital backsplash for smart home control. GHSP's smart digital backsplash converts the kitchen backsplash into an interactive control panel. The coolest smart home device I saw at CES 2019 wasn’t even in the smart home area at the Sands Expo. It wasn’t even in the Las Vegas Convention Center Central Hall with all the incredible new TV displays. It was tucked away in North Hall of the LVCC with the automotive booths. That was where I found GHSP, a global OEM supplier in the automotive and premium appliance industries based in Grand Haven, Mich., demonstrating its smart digital backsplash. The company’s smart surface turns an everyday kitchen into a technology hub by converting the backsplash to an edge-to-edge touchscreen and brings the oven’s cooking controls to anywhere in the kitchen. Users can look up recipes online, play a podcast, or close the garage door, all from the same interface. “We’ve also reimagined the kitchen, creating a digital backsplash smart surface where consumers can access and control their favorite features and apps. Even the oven controls are moveable and can be accessed virtually anywhere,” said Smeyers. If you want the backsplash to look like a conventional tile backsplash... presto... just configure it. The CES demo is currently a prototype. The company says it will be able to connect to particular appliances and devices in the home in the future. The unit is also compatible with Amazon Alexa and Google Assistant. Ian Sage, chief engineer of innovation at GSHP, says the smart digital backsplash could be fully compatible with any third-party control system, depending on the manufacturer's choices. "Even the oven controls are moveable and can be accessed virtually anywhere." The unit is a multiscreen controller built on large-format wire mesh touchscreens. GSHP says it is investigating new large format display technologies. There is currently no pricing available on the product, primarily because GSHP doesn’t want to actually make it themselves, rather find a partner to build it and market it. The company also showcased a travel pod interface for vehicles with a wireless charging capability for mobile phones using the Qi wireless standard, and an automatic disinfection technology using UV-C light.